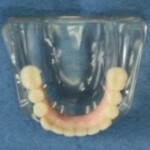 A hybrid denture before it has been placed. Occasionally, we have a patient that’s been wearing dentures for so long that their mouth is a complete disaster. Their face has sunken in, their dentures can’t function properly, and it’s nearly impossible for them to eat. This is the result of a bone atrophy commonly known as facial collapse– which is a side effect of dentures. If you’re in this situation, hybrid dentures may be your solution. Hybrid dentures replace your missing teeth and gums, as well as the bone in your mouth. The hybrid is anchored to your mouth using dental implants. Hybrid dentures look and work just like your regular teeth. There are two types of hybrid dentures we place– fixed and removable. Both types will be anchored by six to ten dental implants. While they do replace missing gum tissue, they don’t rely on any tissue support and are entirely supported by implants. This makes them very comfortable and natural-feeling, all while being extremely stable. When we place a fixed hybrid denture, screws hidden inside your teeth anchor the restoration to the implants. The screws are then covered with resin so they’re completely invisible and inaccessible. However, they CAN be taken out by a dentist. 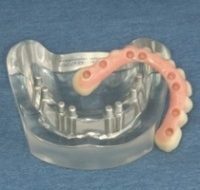 Removable hybrid dentures use the same process as fixed, but they’re anchored by fewer implants. As a result, they’re much easier to remove and replace– if needed. There’s not a recognized specialty in dental implants, so no dentist can actually be a dental implant specialist. Yet, some dentists have had so much advanced post-graduate training, that they’re technically specialists without the title. Dr. Burba took the 3i Institute for Implant and Reconstructive Dentistry (IIRD) courses and has extensive experience and expertise in this clinical area. You can rest assured you’ll be under the best care with Dr. Burba. If you’ve lost bone structure in your teeth because of dentures, it can be disheartening and embarrassing. If you’d like to find out if you’re a good candidate for hybrid dentures, call our office or request an appointment online. We look forward to working with you and restoring your smile. Dr. Randall Burba is an American Academy of Cosmetic Dentistry accredited dentist, with a practice in Salem, Massachusetts. He considers himself an artist–with teeth and beyond! 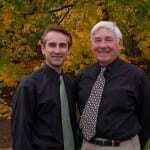 He often paints, draws and has a passion for woodworking.